A keylogger can be either a piece of software or a small hardware device that is used to capture the keystrokes that are typed on the keyboard. The hardware based keylogger can be easily detected because the physical device needs to be connected in between the keyboard and the USB/PS2 port. However, as for a software keylogger, it can be run while being completely invisible and not get noticed by average computer users. They’ll have to fully depend on security software such as anti-keyloggers or antivirus packages to tell them that a keylogger is present on the system, or else they have no idea that everything that they do on the computer is being monitored. There are many legitimate uses for a keylogger such as monitoring your children, making sure that they stay safe on the Internet especially when chatting and making friends with strangers. Or maybe even monitoring your employees making sure that they do not copy or leak out any confidential files. However it can also be used for illegal purposes such as stealing your friend’s password and etc. 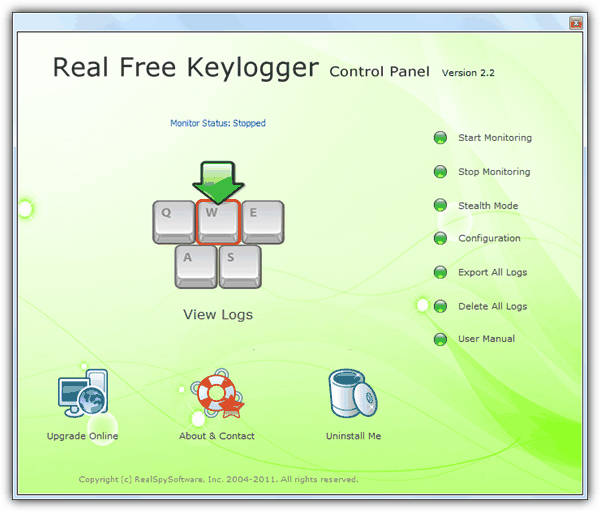 There are many software based keyloggers found on the Internet, some are freeware while others are shareware that require a paid license to use. Generally speaking, a shareware version of a keylogger normally has better invisibility to prevent being detected by advanced users, maybe security software and also has more features. As for the free keyloggers, they are often very limited in functionality and stealthiness. After testing nearly 2 dozen free keyloggers, we’ve picked what we thought were the best and sorted them into a top 10. It is able to log keystrokes, clipboard data and site addresses without the screen capture which is fine for people who don’t want to capture screenshots. There are a couple of invisibility settings such as the hidden mode hotkey (default Ctrl+Shift+Alt+U), removing shortcuts from start menu and uninstall list. Ironically the most downloaded keylogging tool from CNET download.com barely made it to this top 10 list because the most important stealth feature which is starting the program in hidden mode is disabled in the free version. You can set it to automatically start the program with Windows but it will show a tray icon at notification area and anyone can access to it because there is no password protection feature. You can however manually hide it by clicking the “Apply & Spy” button to keep it running as invisible until the next reboot. REFOG is a very popular company that offers a range of keyloggers catering for home, business and corporate use but unfortunately the free version is very basic as most of the important features have been disabled. 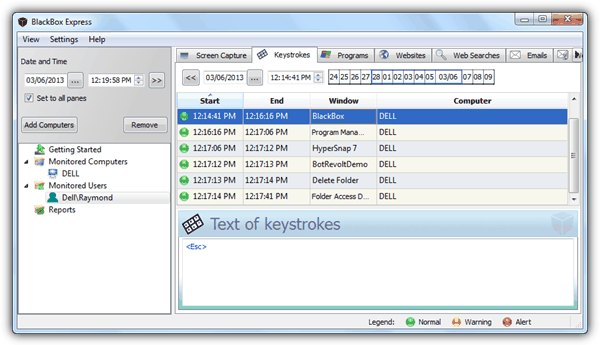 The free version of REFOG keylogger can only monitor keystrokes, visited websites, clipboard, ran programs and computer activities. The biggest drawback would be the inability to run totally invisible because it shows a noticeable tray icon in the notification area and fortunately the program can at least be password protected. 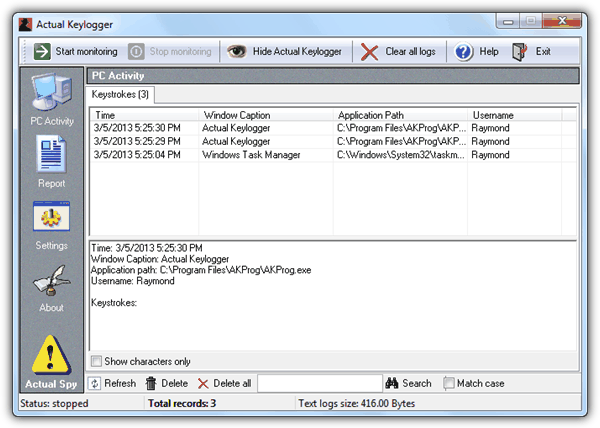 We also found out how to remove the full version of REFOG Keylogger, which turns out to be quite easy. 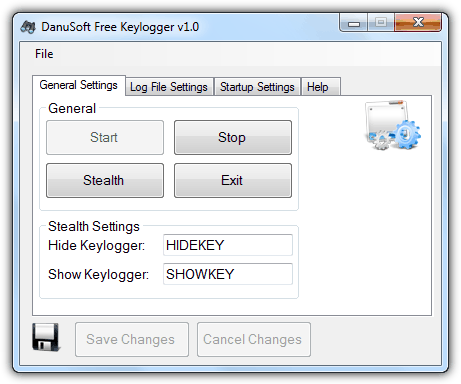 DanuSoft is a simple and easy to use free tool to capture keystrokes. The only way to hide and unhide the program is by typing a chosen keyword, for example the default hide keylogger keyword is “HIDEKEY” while to show is “SHOWKEY”. You can configure DanuSoft to automatically run as stealth during system startup from the Startup settings tab. It doesn’t have the ability to protect the program by setting a password, although it runs as invisible in Windows but not in task manager or explorer. This author of this keylogger seems to have abandon this project because it is not found on the official DanuSoft’s website but can still be downloaded from CNET. After installing Real Free Keylogger to log the keystrokes, running it the first time will prompt you to set a password to protect the program so that only you can access the settings and view the logs. You can set a hotkey (default Ctrl+Alt+X) to launch the program when it is running in stealth mode. It comes with a scheduler to automatically start logging and the log files can be exported as a HTML file. The program folder is set as system attribute and is only visible when the Hide protected operating system files is unchecked in Folder Options. Revealer Keylogger Free is the second most downloaded monitoring tool in CNET Download.com. After testing, we found that it is very responsive and light on system usage. It can record keystroke, has multiple language support, startup settings, ability to run with elevated privileges, hotkey support (default Ctrl+Alt+F9) and automatic log cleanup. Screenshot capture, automated delivery options and additional stealth features are disabled. The program can be protected with a password, and is invisible in the taskbar and in add/remove programs. To uninstall, you can do it by running the program, click on the question mark icon at the top right, go to Program end and select Uninstall. Pay attention during the installation because it prompts to install adware. KidLogger is an absolutely free and open source user activity monitoring tool. Other than just logging keystrokes and clipboard, it can also record USB drives/files/folders usage, sound from microphone and taking screenshots including Skype videos. You’re able to set keywords as an alert during capture. The log files can either viewed locally or from your KidLogger’s online account. 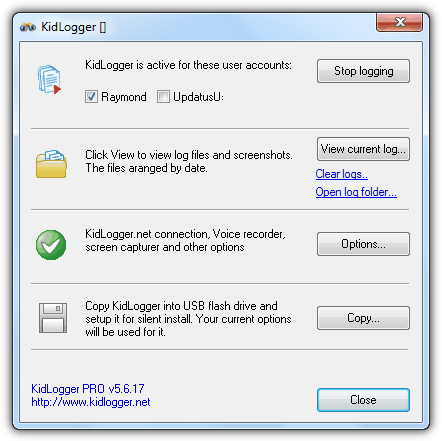 KidLogger can be installed on Windows, Mac OS X, Android, Symbian, BlackBerry and iOS. KidLogger runs hidden in background but visible in task manager and explorer. There’s no hotkey or run command to launch the program so you’ll need to run the shortcut or from the executable file itself. KidLogger can be password protected. BlackBox Express is a free security monitoring software that can be used as a keylogger. The way BlackBox works is slightly different compared to the rest on this list because it can monitor 1 local PC and up to 200 remote computers on the network. It can log keystrokes, web searches, ran programs, visited websites, email client programs, webmails, instant messaging chat programs and capture screenshots. Other than that, you can exclude the user that you don’t want to monitor on the computer. Alert notification and the ability to generate report that can be printed, saved as a HTML or emailed. BlackBox Express runs as a service and hidden by default that does not show up in the taskbar nor display an icon at notification area. However you can still find the process in task manager and the only way to launch the program is from the shortcut or alternatively running the executable file from the unhidden program folder. Password protection is supported. You need to register for a free account to download the installer. 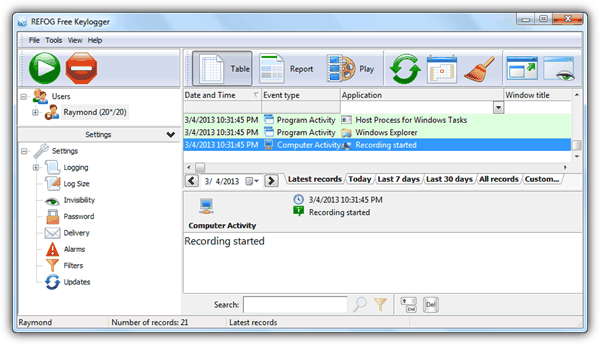 Spyrix Free Keylogger is the free version of the paid Spyrix Personal Monitor. It is able to capture keystrokes, clipboard and take screenshots but advanced features such as social network & IM capture, visited webpages, log delivery and alerts are not available. When Spyrix is hidden, it can be launched with either a hotkey (Ctrl+Alt+A) or run command (runkey) and can be protected with a password. Spyrix Free Keylogger has a lot of potential to take the higher spots if the capabilities of hiding itself are improved. Although Spyrix appears to be hidden from normal eyes, it can be easily spotted from the task manager with the process seen running as system user when hide in task manager option is checked. The program’s folder is not hidden as well. iSam is the free keylogger that’s packed with features such as the ability to capture keystrokes and take screenshots, set a hotkey (default T+G+Enter) to run the program, password protection (default 1234), automatic emailing log files, keywords marking, displaying banner to alert the user, scheduler, blocking URLs and exclusion filtering system. 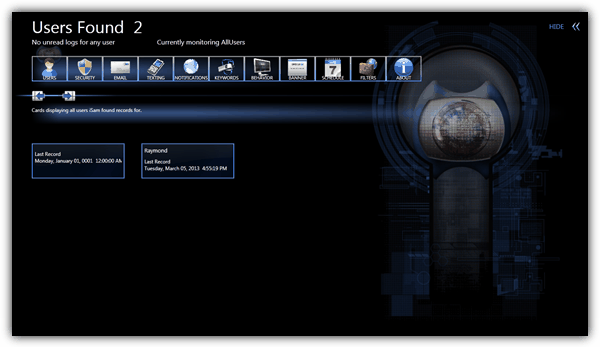 The configuration window runs in full screen with a dark background with options that are not really that user friendly and requires a bit of usage and time to get used to. Microsoft .NET framework 4.0 must be installed before you can install iSam. Although the program is hidden when running, it shows up in task manager, program’s folder and uninstaller list. Actual Keylogger used to be totally free but the current version has turned into a shareware with the program renamed to Actual Spy. Although the last freeware version 2.4 was released back in 2006, it worked perfectly when we tested it on our Windows 7 32-bit operating system. It can only capture keystrokes and allows you to access the program in two methods which is hotkey (Ctrl+Shift+Alt+F7) and run command (akstart). Out of all 9 free keyloggers mentioned above, Actual Keylogger has the strongest stealth features and runs totally invisible including during Windows startup. You won’t find the process in task manager, the program folder is hidden, shortcuts are removed, and it doesn’t show up in the Windows uninstallation list. As an additional security feature, Actual Keylogger can be password protected to prevent unauthorized users from accessing the program and log file. You can still download the free version of Actual Keylogger from CNET but make sure you click on the direct download link. I’ve just tried Iwantsoft Free Keylogger, and I must say it is the absolute winner for me. It records literally everything, and it includes such professional features as website blocking, alerts, quick installer builder etc. It can even deliver your logs in 4 different ways. And it is REALLY free, the advanced options are NOT locked, unlike the other programs! PS: You have an outdated version in your review. It’s already 5.0 on their website. I am looking for a keylogger that can be used on 2 computers, iPad, android and iPhone. Suggestions? Which key logger will show u the most info, including screenshots, run invisibly, and do they encrypt encrypted emails and messages? Raymond, thank you very much for the very good list. I know some of the keyloggers that you posted and have used them by myself. I can recommend Refog Keylogger and also Actual Keylogger and Revealer Keylogger. All of those programms will help you and surelly can recommend it. However, allow me to mention Rymond: none of them are free. The Trialversion is FREE as with almost all programms. But they are not free. The Keyloggers that I like most and that I did not find on this list are: Ardamax Keylogger on the one hand ( ardamax.com/ ), and also my all time favorite Wolfeye Keylogger ( .wolfeye.us/ ). Of course they also offer a trial version, and Wolfeye Keylogger gives you a real FREE version for one computer. But the reason I recommend these is: they both run extremely stable and take very little system resources. And also for me they are very easy to use. Finally the support is awesome which I find very important too. Do any of these product not get picked up by virus software, not cause glitches with the mouse, AND run completely undetected? I just need to know which keys are used the most when I clean the keyboard (tiny alcohol prep pads- don’t want to waste them on unused keys)…maybe a uv light or something. Do any of these detect the virtual keyboard in windows? Do any of these keyloggers report *how long* a key was pressed (in milliseconds)? I would like to see how long my keypresses vary from key to key. Example: I press ‘j’ for an average of 150ms, but I press ‘i’ for an average of 210ms. May you can use this code for each key. And run while your computer is on. But to do that well, you would need an specific device. It is very difficult to measure the time you are pressing a key just by software, because this data is no relevant for keyboard function, just to repeat a key, so the interval measured is much longer than 1 milisecond. However you can install an electronic signal capturer between your keyboard and your computer in order to get all electronic signals and sending time. Are any of them runable with startup, aside being invisible ? Why don’t you think so? These are keyloggers so if you type something into a browser, they will record it. But in the password box? Yes, a keylogger can detect what is written in the browser password box. Flogger is password protected to hide the virus inside! It’s a keylogger, do you think antivirus software is always going to ignore software like this? Even though it is a keylogger, VirusTotal gives this a detection score of 8/63, and 7 of those are just guesses and not actual “detections”. Seems like your employee can’t follow simple instructions on the proper use of company equipment. You’ve advised her about it – I’d say it’s time to start looking for a replacement. Bonus points if you can get her to train the replacement. Agreed on the filtering by router/firewall. Disable the ability to do live streaming amongst other things. If that can’t be done, what other things aren’t secure there? is that keylogger able to monitoring remote pc activities and how do we need to send a remote file ? The best use for a keylogger, IMO, is to log your session, so if there are any file problems, you can recover all the text that you wrote. I am looking for a Keylogger software (either free or paid) to mainly monitor and record the emails sent and received by the employees (Online Activities) in the company I am working for it. Can anyone advise what is the best application to be used for that purpose? Thank you. You do not need a keylogger for that. You just need to be admin for you email server. Have all emails copied to an external account that only you have access to. Monitoring emails is legitimate if you have a policy (signed) by employees that states you will monitor email and browsing use. Using a keylogger is not, and I would imagine if found out you’d get some very annoyed employees who would be looking to leave very quickly and do so via a tribunal. G³ iSam. License: “Free to try for 3 days! It is currently $37.40 to purchase which comes with a lifetime membership and 3 floating licenses or keys that can each be updated for free for life.” “Although the program is hidden when running, it shows up in task manager, program’s folder and uninstaller list.” Very bad. WOw, this article may do me a great favor. I’m using best free keylogger. good enough for me. yup it’s a nice app. Any of these work, if the computer just booted up then no, you have to run the program first. But if it asks for an admin password ( Such as updating Java or Adobe Flash Player ) than yes, it will record the data. I used NetBull keylogger recently and I must say it’s very good. Raymond, I suggest you test NetBull, it would be a good add-on to your list. I have to use the Actual Keylogger on my computer. Is it 100% safe? I’m afraid that he’ll send my logs to the people who can misuse them. Grreat and very informative about the most valuable keyloggers. I use Spyrix keylogger. Spyrix provides free keylogger software which is helpful for monitoring your children, spouse, employees in company…. Nowdays people open their email through smart phone. If i want to purchase an keylogger to crack an yahoo password and i dont have any physical access to it, if the device is smart phone. Will it success? Can you suggest the best keylogger to this situation. Hi, do you have any suggestions that will work on smart phones? Looking for an App that is free, hidden and will work just like some of these keyloggers. Any information will be appreciated. Thank you. Great list! I’m using revealer free keylogger. It’s perfect! Thank you for the post about the top 10 keyloggers, Is it undetectable? and can it be attached to link & send it to email? I was just wondering if there is malware in the actual keylogger . My antivirus keeps popping up and I realize that the keylogger is spy ware. I just don’t want any other malware added at the same time since I will have to give it permission to run. Which keylogger are you talking about? Most antivirus software will complain when you install a keylogger on purpose because of what it does and the methods it uses to achieve the keylogging. thanx Raymond… same with you….